Ring: If only I had more than ten fingers, I could continually and infinitely stack rings to my hearts content! Baubles on top of baubles! This adjustable ring features a druzy-like stone in organic shapes – the asymmetrical center stone is perfect for stacking! Put together the pastels for spring-time perfection, or add in the elegant metallic black version for a dose of nighttime sparkle. To purchase visit Bauble Bar, here. 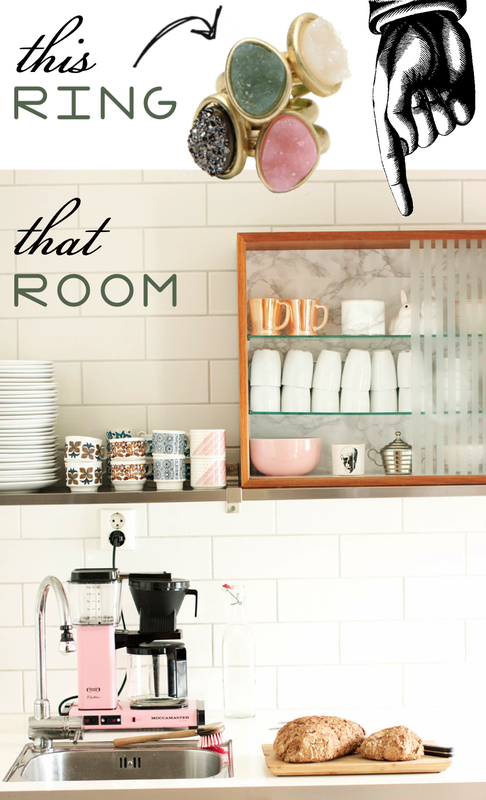 / Room: Can we talk about the interplay of the metallic silvers, golds, and soft pinks? Gentle, european yet industrial! Also, who doesn’t want crusty bread? Image found via Norwegian blog Designhund. Ring: Have the flora and fauna of the wild been calling to you? Do you want to represent the animal kingdom in your everyday wear? This striking 14k Gold Plated House Of Harlow Antler Long Ring features a Cabochon Blue stone framed by an Antler inspired design. The ring has the glamour of the 1970’s with the excitement of an African safari! To purchase go here! 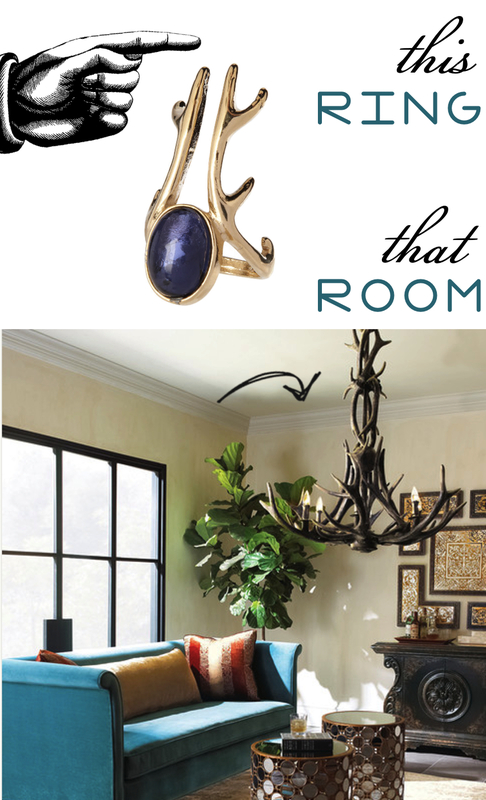 / Room: The people at Horchow strike again with this Faux-Antler Chandelier, wool rug, and jewel toned teal sofa! The light streaming in also perfectly reflects off of the mirrored side tables (also don’t you just love how two small tables pushed side-by-side become one long coffee table?) Image found here. Ring: Made in Italy by the famed Alexander McQueen design house this Swarovski crystal accented wrap design embellished with two skulls is both opulent, exuburent and yet macabre! To purchase, go here. 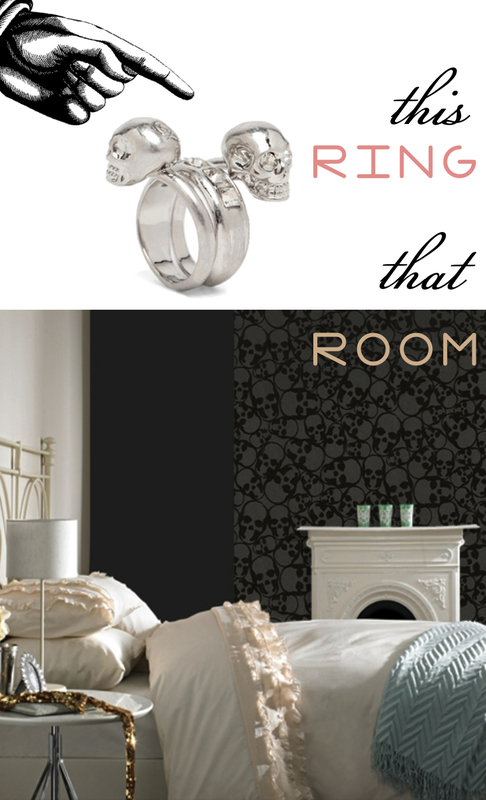 / Room: Perhaps this skull wallpaper will be so wicked that it will war off your nightmares? The mix of luxury metals and dark wallpaper makes a lavish bedroom! The magnificent Skulls design reflects Barbara Hulanicki’s mischievous side. She says, “I love the almost shock element that you don’t instantly see the skull design unless you really look at the paper. She jokes, “This wallpaper would be particularly good in the guest loo!” To order a sample or to purchase, go here.